When you consider the number of miles most trucks travel on a daily basis along with the fact that each truck is effectively a large, blank, moving canvas, you get a unique advertising opportunity. The surfaces of the truck can function great as a moving billboard – a billboard that can spread your advertising message to people right along your truck route. 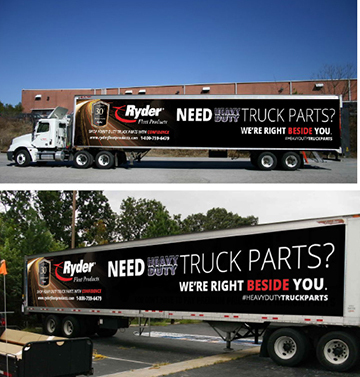 Ryder began working with Media Vehicle Graphic Solutions in Georgia to help create and install full color truck-side graphics on a select number of our North American trucks – beginning the journey of driving through the advertising clutter that exists with so many mediums today. According to “The visual impact of trucks in traffic,” a study completed by The American Trucking Association, 98% of truck ads create a positive image for the company. To find the right theme for the campaign, our Marketing Department came up with several different options. In the end, the message, “Looking for Heavy Duty Truck Parts? We’re Right Beside You”, was chosen because it’s short, it’s simple and the phrase “we’re right beside you” works well whether you go with the literal meaning or view it as a reflection of the support that we strive to offer to our customers. We look forward to connecting with a new and unique audience as we take our message on the road. Visit Ryder Fleet Products for more information or to purchase heavy duty truck parts, shop supplies or maintenance and repair tools for your vehicle or fleet. This entry was posted in Uncategorized and tagged advertising, heavy duty truck parts, Ryder Fleet Products, Scott Gates by Ryder Fleet Products. Bookmark the permalink.